Household debt rose to $US11.71 trillion in the third quarter. According to the New York Federal Reserve’s latest Household Debt and Credit report, household debt in the third quarter rose 0.7%, or $US78 billion, to $US11.71 trillion, up from $US11.62 trillion in the second quarter. Overall, household debt is below its $US12.68 trillion peak reached in the third quarter of 2008. Mortgage debt rose by $US35 billion, or 0.4%, to $US8.13 trillion in the third quarter. Student loan debt rose by $US8 billion in the third quarter to $US1.13 trillion. About 11.1% of aggregate student loan debt is more than 90 days delinquent or in default. Auto loan balances rose by $US29 billion while the delinquency rate on auto debt fell to 3.1% from 3.3% last quarter. Home equity lines of credit declined by $US9 billion, or 1.7%, in the third quarter to $US512 billion. 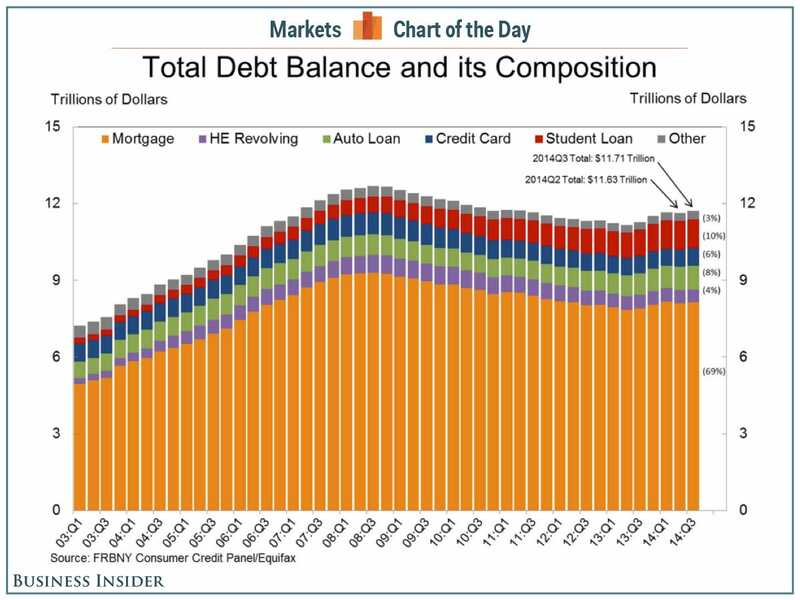 Non-housing debt balances increased by 1.7% in the third quarter. Overall delinquency rates were roughly flat in the third quarter, with 6.3% of all outstanding debt in some stage of delinquency compared to 6.2% in the second quarter. 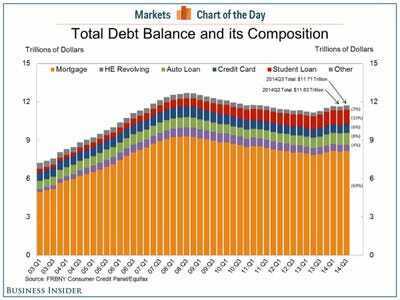 Here’s what all that debt looks like.